Fresh. Fast. Flavorful. Our easy prosciutto-wrapped asparagus recipe makes an appealing appetizer or simple side dish. 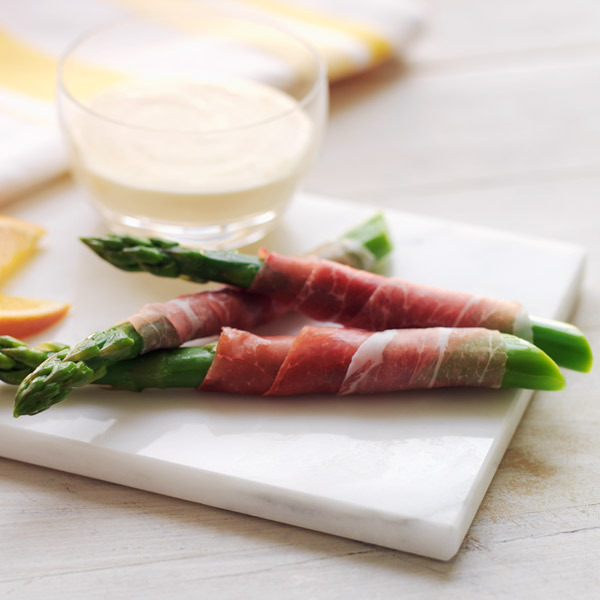 Steamed asparagus spears are wrapped in thin slices of prosciutto and then served with our deliciously dippable orange cream sauce. What a tasty way to eat healthy! In medium bowl, whisk together mayonnaise, orange zest, orange juice and pepper. Refrigerate until ready to serve. In vegetable steamer (or asparagus pot; see tip), cook asparagus until crisp-tender, about 3 minutes. Rinse asparagus under cold water to stop cooking. Pat dry. Wrap each asparagus with piece of prosciutto. Serve with orange cream for dipping. Garnish with orange wedges. Tip: There are tall, narrow pots designed specifically for steaming asparagus. The spears are placed standing up in a steamer insert, which puts the fatter ends of the spears closer to the heat source and the more delicate tips farther away. Of course, a regular steamer works fine.